Oh my goodness...lately, it seems like Pinterest is everywhere! 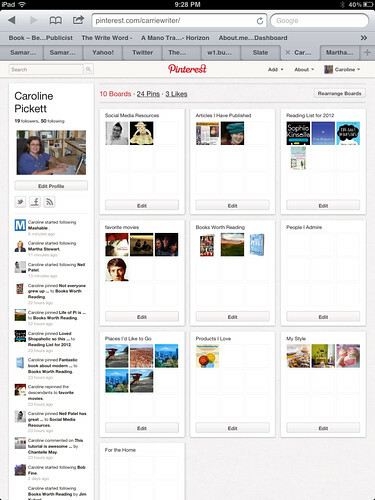 Instructions on how to use Pinterest, tips for bookmarking and iPading on Pinterest, Pinterest for authors, chefs, designers, travelers, architects, fashionistas...you name it, there's a bulletin board and a pin for it. So, you can crawl into a social media hole and pretend Pinterest doesn't exist, or you can jump into the fray and start pinning away. I'll admit that while I ignored Pinterest at first, dismissing it as the latest platform du jour that would be replaced soon enough, I stand corrected. Pinterest is now rated as one of the top 5 social media platforms, right up there with some company that started out as a book about Faces, and another that has something to do with a turquoise bird. Of course, once I got invited to start an account and began exploring, I immediately found it addictive, and naturally started posting boards and pins on all my favorite topics--books, writing, travel, social media, nonprofits, etc. Pinterest also has great applications for marketing and networking, discovering new interests, and rediscovering old connections. Since starting my account, I've been amazed at the number of new and older followers I've gained in such a short time, and it's been feeling a little like a social media reunion! One of the great advantages of Pinterest I noticed right away is that it's a visual form of microblogging, with images and captions taking the place of blog posts, tweets, and updates. If you're in anyway visual, or love photos and graphics, you'll love Pinterest, especially once you get the hang of it. I invite you to follow me, look forward to following you, and in the meantime, onto favorite blog posts. 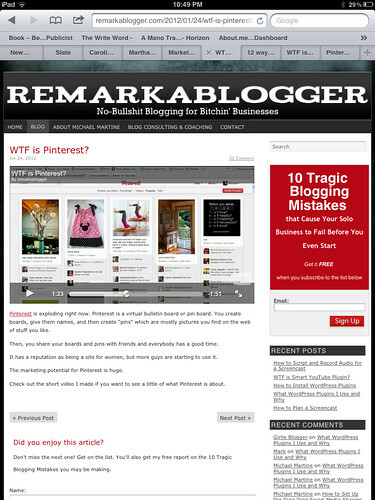 Provides an in-depth overview on everything Pinterest, including how to pin, 10 tools to help you find great content, 9 reasons why marketers should use Pinterest, (re-pinning is the new retweet), and a list of 21 brands currently active on Pinterest, such as SFMOMA, Etsy, Martha Stewart Living, Mashable, Gap, and others. If you're waiting for the next mini book on Pinterest, this is it. Features an excellent and detailed pop up slideshow on some of the finer points of Pinterest, including its mobile application, integration with Chrome, and adding pricing to your pins. Francisco Rosales features some interesting graphs and stats in his post, including the fact that 80% of Pinterest users are women; the biggest age groups are between 25 to 44; 60% of its users have some college; and largest percentage of household income is between $25 to $75k. Michael Martine provides a thorough and entertaining screen tutorial on Pinterest, that explains its features quickly and easily. I've chatted with Michael before and subscribed to his blog for years, and he's definitely a trusted authority on social media and all things online. Forbes contributor Gene Marks offers up a bouncy overview, pointing out how small businesses are always chasing after the social media ROI rainbow, and yet never finding it. But it's human nature to get excited about new stuff, and so be it. "How about SFgirlbybay (almost 476,000 followers)," he writes. She’s hip. She’s cool. She’s a self described “photographer, photo stylist, design junkie and bona fide flea market queen” from the Bay area. And she’s got a place to display all of her cool ideas. Pinterest. I love her site." Thanks, Lisa, hope we can connect there! Will look for your link.